Recently, I read a submission to the ‘TRUCKER’ magazine…. the one normally found at any Petro or T.A. truck stop… a decent trucking publication. The other day, I read a letter published by a trucker by the name of Kenneth Silfies Jr., giving his views on electronic logs. His opinion was valid and well thought out, as are most submissions by truck drivers to this section of the magazine. What struck me though was his closing line. After discussing the ups and downs of electronic logs, he summed it all up by saying “This is all I ever wanted to do”. Here’s a guy who only ever wanted to drive a big rig for a living. 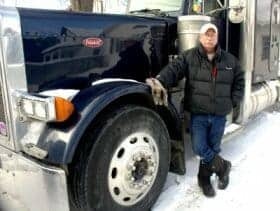 He wanted to be a trucker, in spite of all the ups and downs of the trucking industry. I thought, ‘Right on… that’s just the way I feel.’ I don’t think Kenneth could have said it any better. It’s hard to say if it’s the same when it comes to other lines of work, as trucking is all I’ve ever done. But I bet every job has it’s ups and downs, too. I have several family members who are teachers. They loved the teaching part of the job, but they retired early because they couldn’t stand the politics involved with their jobs. For the most part, there’s not that kind of politics involved in driving a truck. Heck you rarely have to deal with anyone with the exception of a dispatcher or a customer once in awhile and I like that. No time or cause for office politics. Yes, trucking for a living has its down sides. The pay for truckers is no longer what it should be, the government and the D.O.T. keep coming up with endless rules and regulations, half of which seem to have no basis in common sense. Sometimes we get dispatchers young enough to be our kids, who have no idea of what our job involves… nor do they care. The new trucks on the road today break down a lot and the old trucks can be expensive to repair … fuel and insurance costs are way too high. You can’t afford to eat in the truck stops every night, if you are even lucky enough to find a spot in one to park. But even in spite of all these things, I’d still rather drive a truck than do anything else. I look forward to going to work almost everyday and still don’t mind a 14 hour day when everyone else only works 8 to 10 hours per day. I like the fact that when I’m home, I’m completely away from work and no one is sending me emails about work issues or bothering me in any way. My time is completely my own. I don’t have to go back to work until I’m ready. If the dispatcher doesn’t like it, there’s thousands of other driving jobs out there, especially for an experienced driver, and he knows it. I’m my own boss in so many ways. No, it’s not the perfect job…. there’s no such thing. But I know when I’m cruising down the road looking out over that long hood, as I hear the sound of the engine and smell that diesel… I know it’s the right job for me. I still like this job and like Kenneth, it’s all I ever wanted to do.